You see, I was approached for the Cape Town Embrace campaign, and I wrote about it a few weeks back. I wrote all about how even with all the love, support and help that I had as a new mom, it was still so daunting, so scary. And I encouraged all of you to take part in this idea of visiting moms on Mother’s Day. We’d reach out and encourage them, make their day a little brighter and generally just welcome them to the mom tribe. But there was one problem. I had no idea which hospital I’d be going to or what it would be like. So I felt like a total hypocrite, telling everyone to do this and not even sure how I would manage to do it. Well, the amazing Sharon from The Blessed Barrenness stepped up and organized for us to visit Charlotte Maxeke hospital on Sunday morning, and I was blown away. We arrived a little before nine in the morning, and there was a group of about 20 of us. 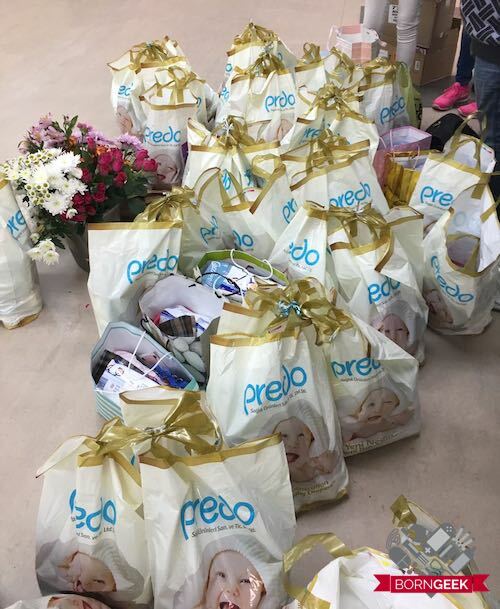 Sharon had gotten sponsors on board and we had over 70 goody bags for the moms, plus treats for the nurses, flowers, and cupcakes. She had been told there were 66 beds, so it seemed quite doable. We’d hand out bags, leave extras behind for more moms who might come through, but mainly focus on chatting to the women, connecting with them. I was excited and more than a little nervous, but I thought it would be great to hear stories and maybe share some of mine if they helped. When we arrived at the labor ward after a seemingly endless journey through the labyrinth of a hospital, there were a few moms ready for visitors, and one who had just had a stillbirth. Sadly, she wasn’t the only one. There were four moms who had lost babies who were being cared for in the wards. We walked from room to room and met so many moms in the main maternity wards – there were just so many moms. I spoke to one new mom who was nursing her baby when I walked in. I asked her name, the name of her baby, and then told her how amazing it was that she was already breastfeeding so well. Already a pro, already doing so well for her little one. She smiled broadly and I realized that I was probably the first (or only) person to compliment her for this. But truly, my hardest moment was when I thought we were almost done. We had been up and down the wards chatting to moms and offering support and a few words of kindness to go with some Mother’s Day spoils. Then we were offered to go visit the NICU. As most of you know, that’s where Harley was for the first five weeks of her life. It was so hard then, and I thought, of course, I’d like to see those moms and tell them that it gets easier. Well, I was in for quite a shock. Anyone who has had a baby in the NICU is all too familiar with the smell of hand sanitizer. I was instructed to sanitize my hands upon arrival, then I’d wash my hands in a special sink once through the outer door to the unit, and sanitize again once through the second door before touching my tiny preemie or anything associated with her. When we walked into the NICU, every single sanitizer station was empty. I had to ask one of the sisters for hand sanitizer for everyone. Then I walked into a room that took my breath away. There were eight beds, each filled with a mom and her preemie doing kangaroo time. So many tiny little ones, resting on their mom’s chest. There was one nurse sitting at the end of the room. I went by the window and chatted to a mom – her son had come at 30 weeks pregnant. His name was Hope. He was so tiny, so fragile and reminded me so much of Harley when she was new. I asked the mom how long she expected to stay in the hospital with her son, and it sounded like they were being sent home within a day or so. It wasn’t meant to be cruel or uncaring, but they simply needed the bed for the next mom and preemie. Another mom I talked to, her daughter had jaundice and was under the lights, had also experienced pre-eclampsia. She had to go home and take care of her son, but she didn’t know how long it would be until her daughter came home. She was scared, stressed, and yet so grateful for a cupcake and some kind words. How was it possible that this NICU was so different to where Harley was cared for. In a private hospital, Harley had her own nurse, 24 hours a day. The nurses knew me. We’d celebrate together when she gained weight, they would thank me for pumping and delivering milk. They called Harley their “Makoti” which means daughter-in-law or bride – it was as if she was their little one, too. But just a short drive away, there were more moms than I could count coping with the same stress, the same terror with preemies, but without the same support, attention, love, and care. It seemed so unfair and was a serious eye opener for me. I have no illusions about what I contributed. I maybe made some of the women smile for a bit. Maybe helped a bit by giving some baby supplies, a word of encouragement and some praise for their incredible strength. I wish I could do so much more. I have ideas and plans, but they will take a while to implement. In the meantime, this is officially my new Mother’s Day tradition. Even once we move to the States, I will find a local general hospital and visit the maternity ward on Mother’s Day, sharing some love, cheer, support and goodies. It has changed the meaning of Mother’s Day for me, and that’s a very good thing – here’s to a new, amazing Mother’s Day tradition.